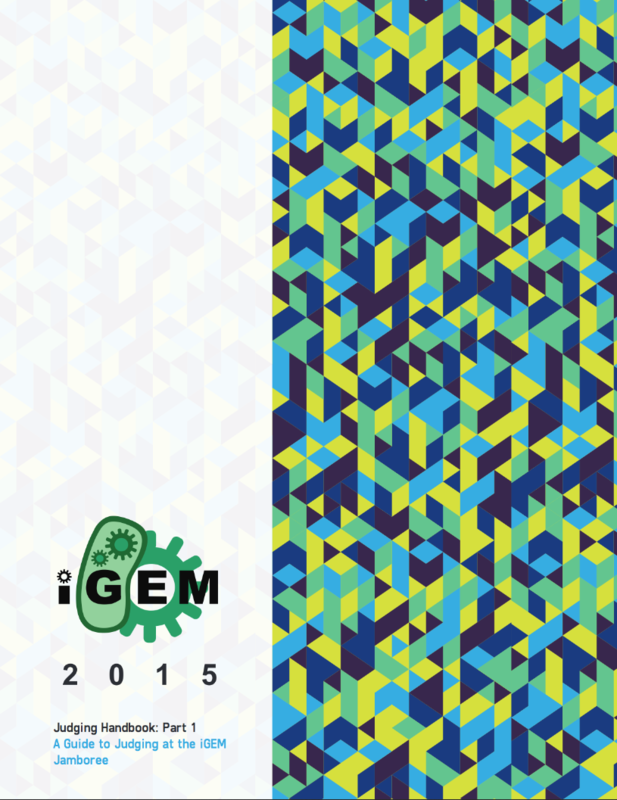 Welcome to judging in iGEM 2015! If you’re new to iGEM, you’re probably working hard on your project, trying to make sense of all the requirements, medal criteria, part submission guidelines and other facets of iGEM so that you can present a great project at the Jamboree later this year. We are making some substantial improvements to the way judging works in 2015. Previously, the judging handbook was released a few weeks before the Jamboree and judges and iGEMers alike would find out late in the season how they were being evaluated. Materials were provided late in the season as that was the timing of iGEM and projects. Because timing was so late for the release of materials, iGEMers did not have much time to improve their projects in response to the case studies authored by the Executive and Judging Advisory committees. Our hope is that by substantially improving these materials and providing them much earlier than in previous years, iGEMers can learn how they could be evaluated and judges will have ample time to familiarize themselves with materials well before we assign teams. One final major change in iGEM is opening judging forms this early in the season. This form is how a team communicates their work with the judges. Teams need to do two things to be eligible for an award, or to indicate they have achived a requirement. They need to complete the corresponding Standard Page on their wiki and they need to fill our the 150 word description or part number on the judging form. If you're an instructor or advisor, consider applying to be a judge! The first round of judge selection closed on June 1st and successful applicants will be announced on the 1st of July. The form is still open for applicants for the second round of applicants and the reserve list. Before evaluation, you should familiarize yourselves with the requirements for iGEM this year. We have a Requirements page for this information. We also have separate requirements for new track teams, as the scope of work is different for these teams. Please see the requirements page for more details and the Calendar of Events page for all the deadlines. In our mission to make iGEM better every year, there are a few differences in terms of the evaluation in 2015. Medal requirements have been slightly modified, so please read over them again on the Awards page. Teams will be required to submit a judging form that outlines their accomplishments according to the Judging Criteria. We have made some significant changes to the way judging forms work in 2015. First of all, we will be releasing them months earlier than in previous years. We're releasing the judging forms much earlier so teams can see which pages they should work on. We have created standard pages with static links in your wiki templates for all special prizes and for most medal criteria. These pages help you be clear about what you have done, and allow the judges to easily find all the parts of your project. You can no longer add links to your judging form, so please check the Judging Forms early and often to see your progress. One major impact this change will have is in terms of how you build your wiki. You can no longer use a web package that does not allow you to use static links. Please take this into consideration when making your wiki. Experienced teams will be familiar with the wiki freeze, the time in the iGEM calendar when we disable editing to allow judges to look at your wikis without them changing. You wiki will be frozen at 11:59 EDT on September 18th 2015. Please see the Calendar of Events for more important dates. The Registry will not be frozen this year. However, you should put up all your part information on the Registry by the time of the wiki freeze. We care about capturing all your part measurement and characterization information and iGEM teams are not the sole users of the Registry, so we do not freeze that site. However, if you have not added all your part measurement and characterization data by the time of the wiki freeze, the judges are not under any obligation to look at new information. For example, if you wait until the Jamboree to put up your part documentation on the Registry, judges evaluating your team may not have time to see it. Judges do not have any obligation to look at part information on the Registry posted after the wiki freeze. Remember - it is up to your team to convince the judges that you have done your work! Please see the 2015 Calendar of Events for all the important dates and deadlines. Apply to be a judge! All judges must apply, even if you were a judge in the past. We are making some important changes to judging in 2015. We are de-specializing judging this year. There will no longer be a dedicated human practices judge in each presentation room. We will still have HP judges, but it will be the responsibility of the the entire judging team to learn how to evaluate areas that are outside of their core competency and research field. To help with this process, we plan to update the Judging Handbook to include case studies and work on all areas that will require evaluation in iGEM. If you're not familiar with how to evaluate human practices, there will be a section. You can also check out the Practices hub. We are working on the handbook and will aim to have it available well in advance of the Giant Jamboree and wiki freeze. One significant change in 2015 will be the judging application form. In 2014, we worked hard on diversity and regional representation in the judging team. This year, we are continuing the democratization of this process by opening up the judging application procedure to the whole iGEM community. We will be publishing a list of criteria for potential candidates when the application form opens some time over the summer 2015. All of our evaluation takes place online in iGEM. Once you are selected to become a judge, your teams will appear in your judging dashboard when we freeze the team wikis. If you would like more information on how to use the online evaluation system, please download and read part 2 of the judging handbook below. Learning how to judge an iGEM team is a complex task and one that we are always working to improve. In 2014, we introduced the judging handbook in two parts. Part 1 of the handbook is dedicated to describing great examples and winning teams from previous years. This handbook focuses on the factors contributing to the success of these teams from the perspective of the judges who evaluated them. Part 2 focuses on how to perform the judging assignment using the online judging systems developed at iGEM. The 2015 Judging handbook Part 1can be downloaded and viewed at the link below. Part 2 will be uploaded closer to the Jamboree. If you are not familiar with how excellence is rewarded in iGEM, we encourage students, instructors and advisers to all read through Part 1 of the judging handbook to learn more about how teams are evaluated.